I wouldn't be surprised if we double the amount of transient moorage revenue this summer. GARDEN BAY, BC, May 30, 2018 /24-7PressRelease/ -- Pender Harbour Resort and Marina has chosen Swift Harbour for it's online Marina Booking platform. The new system allows visitors to make moorage reservations at the resort using any device or via their app for iPhones and iPads. "We are very excited to be using Swift Harbour as our online booking platform for transient boats," states Jeff Peifer, owner of Pender Harbour Marina and Resort. "Historically a customer would call by phone or VHF to make a booking which was a long manual process for our staff and the customer"
The new online system allows a boater immediate and convenient access to self-serve a moorage booking. All boat details including length, beam, draft, power, etc., can now be entered via their computer or iPhone app. "Pender Harbour Resort and Marina is a crown jewel of cruising on the West Coast," says Jamie Copeland, CEO of Swift Harbour. "We are delighted to partner with Jeff and his team to make it easier than ever to book at his facility. I know the time spent at Pender Harbour Resort and Marina will be the highlight of many of our own summers!" The Swift Harbour app is free to download and use. It allows boaters an easy way to discover marinas, explore their services and book a visitor slip in seconds. It brings the modern conveniences of Airbnb and Uber to boating. "Swift Harbor is simply an excellent platform," says Jeff Peifer. "More boaters will find us which will lead to additional business - I wouldn't be surprised if we double the amount of transient moorage revenue this summer." 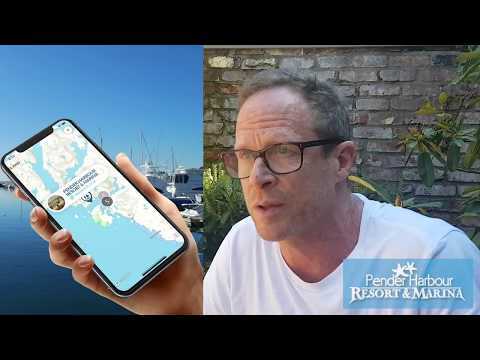 The Swift Harbour system gives Pender Harbour Resort and Marina the opportunity to simplify it's booking administration while creating more value for a customer looking to spend a night or two at the resort. Pender Harbour Resort and Marina is situated in Duncan Bay on the Sunshine Coast. It encompasses 6 acres and 600 Feet of oceanfront in Pender Harbour. The resort offers a wide range of accommodation choices with a 4 bedroom Chalet, 12 cottages with mixed styles and configurations, 2 yurts, 4 motel rooms, 25 fully serviced RV sites and 3 tenting sites. The essence of the resort is a new 2.5-acre marina with 100 slips accepting boats up to 55′ in length. Moorage is offered on annual terms and shorter terms for transient boaters. The 4 motel suites sit above a small convenience store, fishing tackle shop, showers and laundry room. The resort provides a boat launch, fish cleaning station, motorboat rentals, kayak and SUP rentals, a heated swimming pool in summer months, campfire pit with seating, playing field, horseshoe pit and an on-site banquet hall with a kitchen available to rent for special functions like weddings, reunions, or group getaways. The Swift Harbour App is the most convenient way for boaters to discover marinas, explore their services and book a visitor slip in seconds. Free to download, Swift Harbour is a direct connection to marinas 24/7 and provides boaters with the easiest ways to customize, price and book their stay. It streamlines all the time-consuming aspects of booking by saving boat profiles, shore power preferences and more. Swift Harbour even sends each boater a marina welcome package before a stay that includes key arrival instructions, marina maps, and helpful information to get the most out of every visit. Inspired by a life of cruising in beautiful havens worldwide, Swift Harbour is an app built to delight boaters, streamline marina operations and make visitor moorage bookings a simple and enjoyable experience for everyone. For more information about Pender Harbour Resort and Marina, please call Jeff Peifer at 877-883-2424, or email info@phrm.ca. For further information about what Swift Harbour has to offer both boaters and partner marinas contact Jamie Copeland at pr@swiftharbour.com.